Just returned from a great family vacation to Alaska… wow, what great scenery. The grand mountains, glaciers, rivers and the ocean… flowers and wild animals (photos and videos to come). In addition to bus, airplanes, trains, kayak, canoe (and foot) we spent a week touring by rental car. Knowing that three of us would want to keep our devices powered in the land of the midnight sun (most places we visit ed had 19 hours of daylight) I planned ahead and brought two very useful accessories. With each of us using their iPhone for a number of things – mostly for photography and video and traveling with two iPads I wanted to make sure we did not run out of power. I purchased and brought along a dual-port USB adapter. 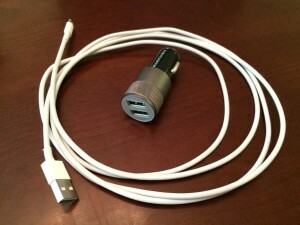 This plugs into the 12-volt (used to call it the “cigarette lighter”) on your car or truck. This allows you to plug in and power or charge two devices at the same time. You could use the regular (1-meter) cable that comes with your device – but I also recommend the 2-meter cable (pictured at right). This allows the person sitting in the back seat to keep their device plugged in while traveling. NOTE: It’s generally recommended you only use these chargers while the vehicle is on – using them for a long time with the ignition off could drain your car battery. Also, when you make a stop – especially at a remote view point or for a hike – remember to take out or hide any evidence of electronics. Do _not_ leave any electronic device in the vehicle, certainly not in plain view. Desperate folks in lots of places will think nothing of breaking your car window if there’s even the suspicion of something worth stealing.